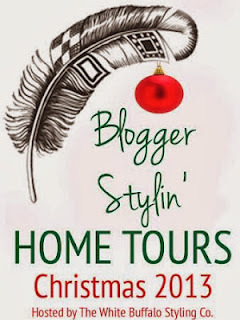 I am so happy to be participating in the Blogger Stylin' Tour: Christmas Edition that Lindsay from The White Buffalo Styling Co. organized. There are 53 bloggers participating, and I am just blown away by the design and detail that I have been seeing. If you are arriving here from Our Fifth House, welcome! 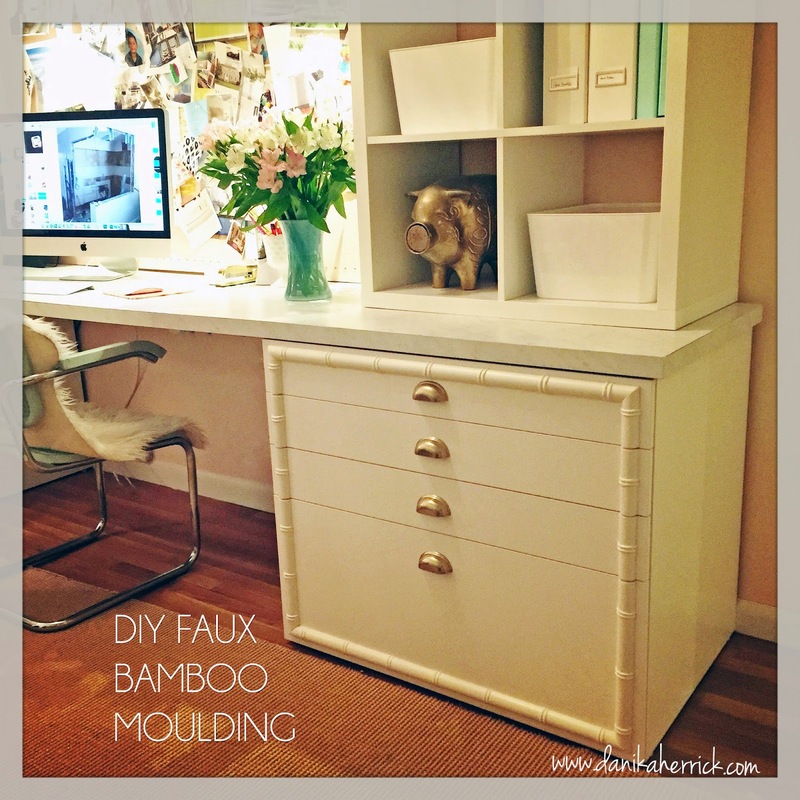 If you are new to my blog, our home has been undergoing a slow moving renovation. We began on a whim 2 days before Christmas last year (and I hosted Christmas). 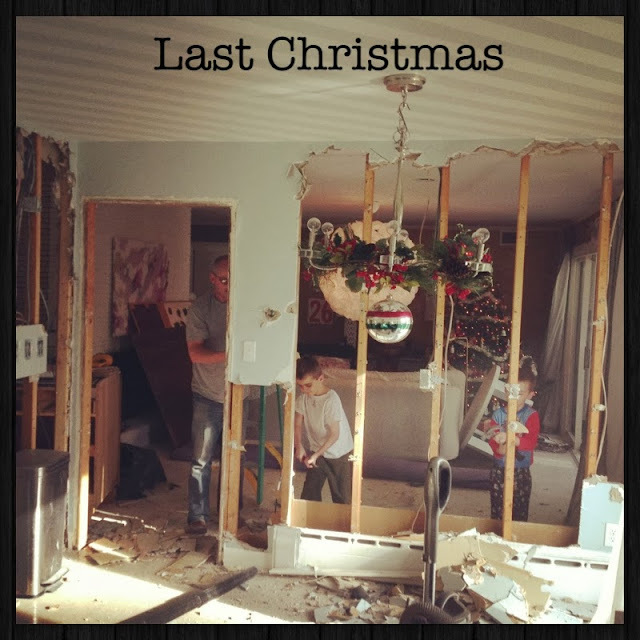 Wasn't the smartest move- but when your husband finally agrees with you that walls need to come down, you move on it before he changes his mind. Our kids thought it was an awesome Christmas! What kid doesn't like smashing things? The dust settled and new walls slowly went up. And here we are one year later. 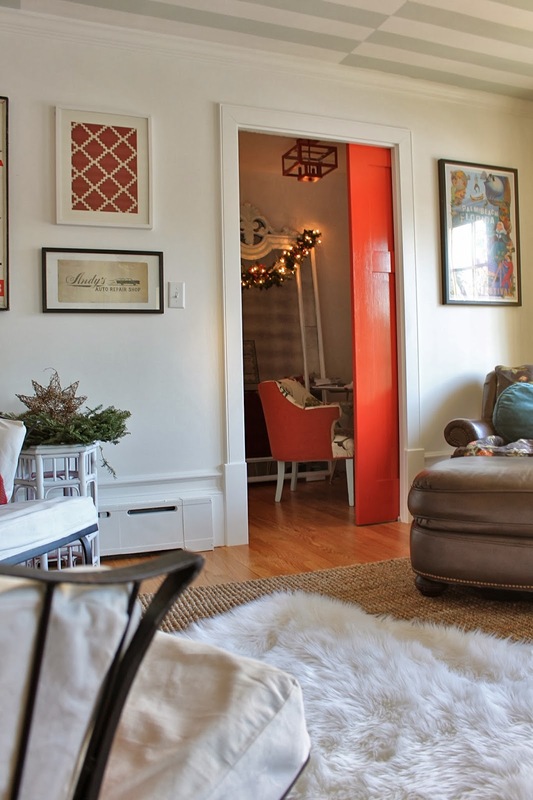 I have to say, I am totally enjoying my coral red door and how well it jives with Christmas. Eventually my laundry room is going in there, but until then I turned it into my temporary office. Added a garland and white lights- very cozy in there! (I will be posting the process on Monday, so please come back to check that out). Can I just tell you, having an actual mantle to decorate is SO nice! My entire space is a work in progress. I still need new curtains, etc. On a side note- I just got a new sisal rug from RugsUSA crazy Cyber Monday 70% off sale. I layered it up with a comfy Flokati from Homegoods. Its all about the layering this time of year. I try to tuck fresh greens where ever I can, like in my firewood box. My tree used to be simple white lights until I had kids. They asked for colored, so that is what we now do. 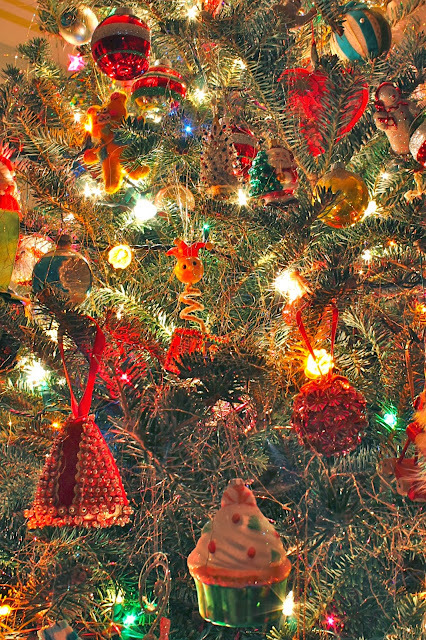 I used to love decorating the tree as a kid, so I try to involve them as much a possible. This room is almost done, please note the building permit is still in the window above! I went a bit retro with my tree. I found this vintage topper on Ebay last year. One of our family traditions is making ornaments each year. Many of the ones below I made with my Mom as a kid. I always want to do a different look to my tree, but in the end I am a traditionalist. I haven't really done much on the outside besides make this wreath. I am hoping to tackle the outside lights and garlands this weekend before the impending snowstorm, and then cozy up to the fire afterwards! Thanks again Lindsay for hosting this amazing series and including me. 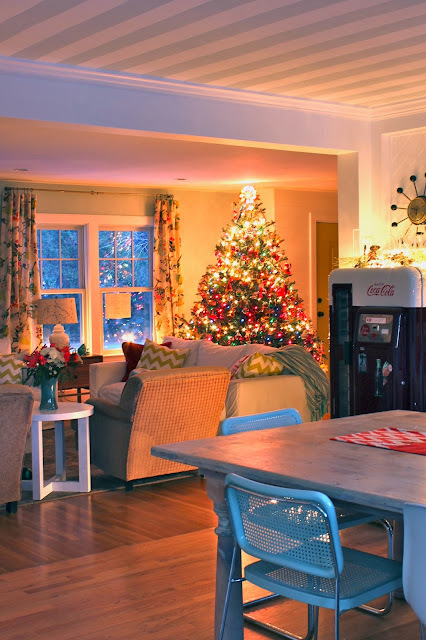 Oh my…you've come so far since last Christmas and everything looks gorgeous. Your tree is glorious and I adore your fireplace and ceiling! 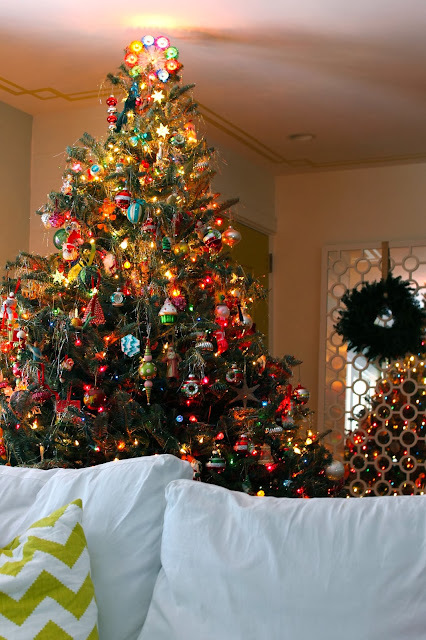 How wonderful to let your kiddos dictate your tree design! Looks amazing! it looks amazing one year later! 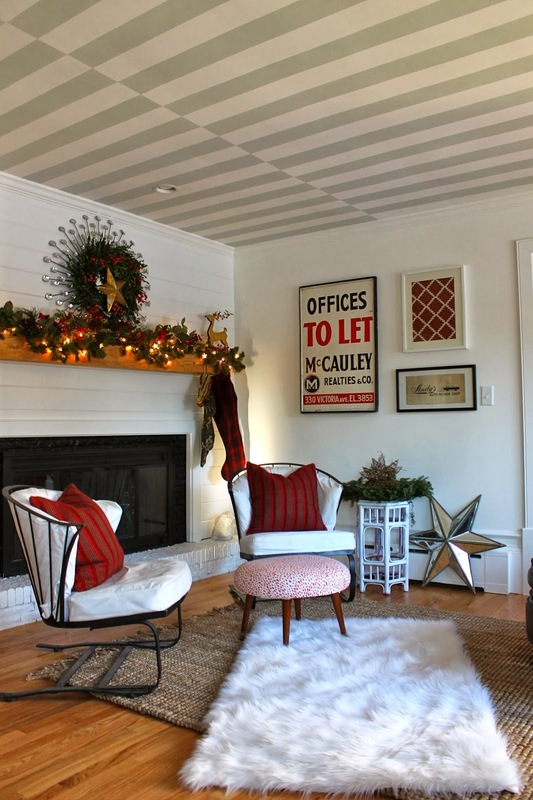 :) the living room is perfect- love the warmth and cozy textiles! Love it! 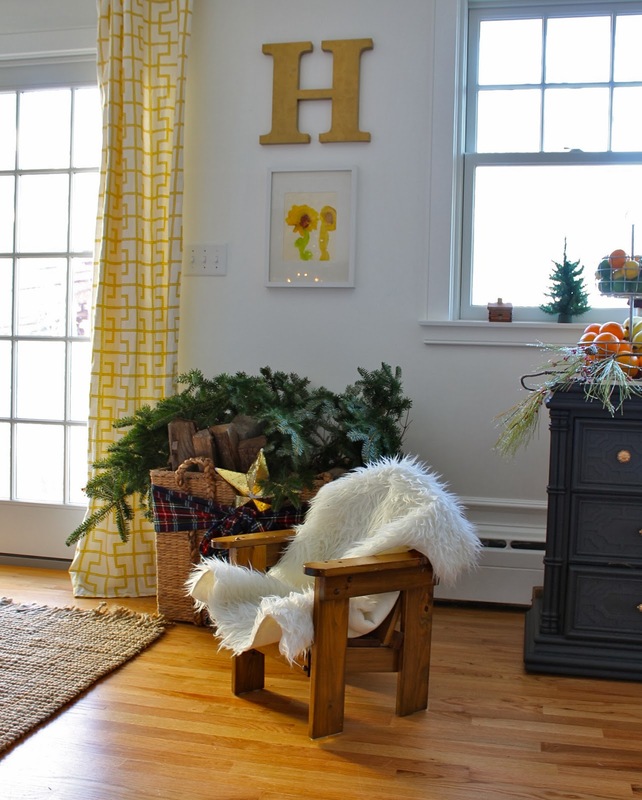 Your reno is fantastic as is your tree and that front door wreath! Awesome!!! 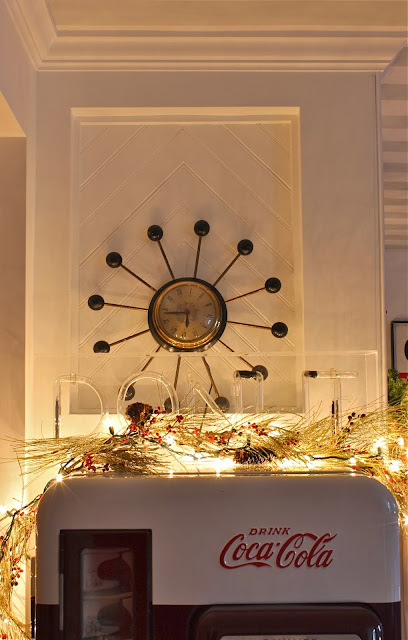 Your starburst wreaths are amazing and I love your cozy mantel and living room...and that red door!!! I have been in love with that ceiling since you posted it - mid process- on instagram! That wreath on the front door is amazing! well done ! it looks great. time you show your images ! it is fun and goes quick ! WOW such a big difference. Hey, whats the holidays without a good story huh! It looks amazing. Love the coral door.